Want to provide sponsorship or help an under-served child but don't know any of the riders? No worries, we can help! Click the sponsorship button and we will find a sponsee for you. 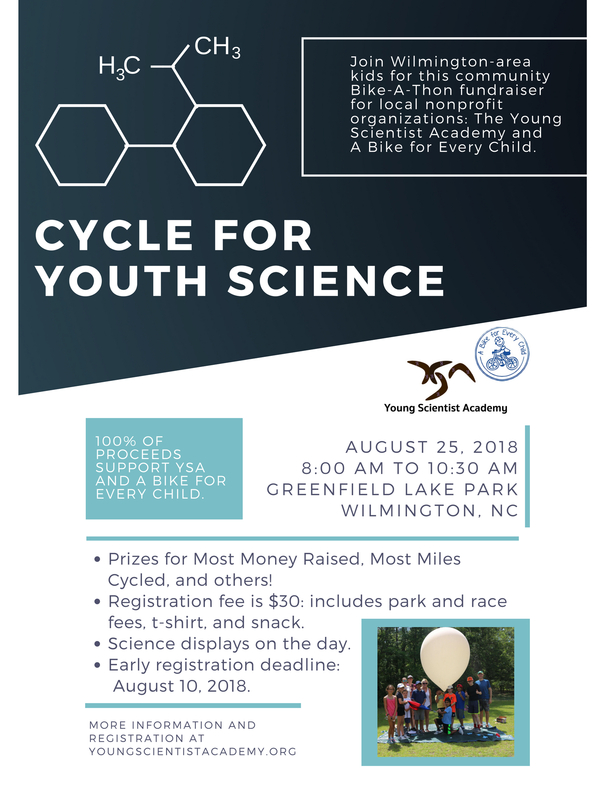 As part of Cycle for Youth Science, we are offering several exciting corporate sponsorship levels to support our 120 mile Tour de Cape Fear and Greenfield Lake Bike-A-Thon Events . Will your company or organization consider sponsoring this community event? Every little bit helps! Click the Support CYS button to pledge an amount now and pay later. Thanks for your help in achieving our goal and supporting our programs. 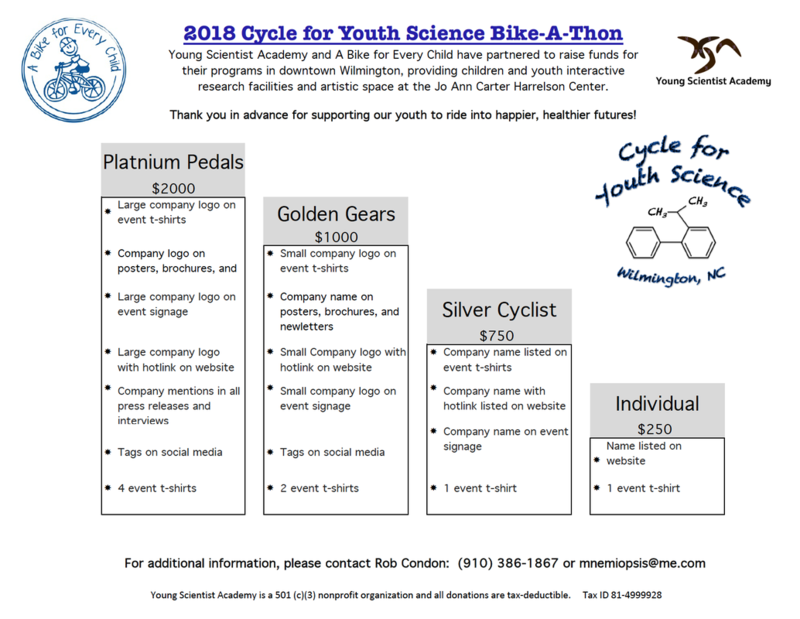 ​In a fun and creative environment, Young Scientist Academy (501(c)(3)) programs engage students’ innate interest in the natural world, allowing them to explore real world research in STEM topics including Marine, Environmental and Atmospheric Sciences, Urban Ecology, and Computer Engineering & Programming. Our priority is to promote youth participation from underserved and downtown communities that are often faced with personal or environmental adversity by providing services at minimal expense to participants or no cost through scholarships. Through these career-building experiences, we aim to provide leadership, skills and confidence in our youth to establish partnerships and service opportunities for local communities. A Bike for Every Child is a 501(c)(3) nonprofit that works daily to fulfill its mission of bringing our community together to “support our youth to ride into happier, healthier futures.” Our vision is to transform lives, one bike at a time, by collecting gently used bicycles from individuals who donate them to be refurbished and given, with a new helmet, to children in need. Knowing the many health benefits of bicycle ownership, we strive to reach all who want, yet cannot afford one.